Casey Burke, Program Manager II, 30 марта 2018 г. We're excited to announce 3 additions to the PowerApps Office Template Series: Meeting Capture, QuickTask, and Company Pulse. This post provides an overview of the functionality for each app, as well as unique concepts we've built into each one. These can be used as-is, modified to meet your specific business needs and branding requirements, or you may reuse the professional designs and repurpose the app entirely. Note: Setup instructions for QuickTask and Company Pulse are located in the hidden Settings screens. These screens are only visible when editing the app. Meeting Capture demonstrates how Microsoft Graph connectors can be leveraged to build productivity apps. 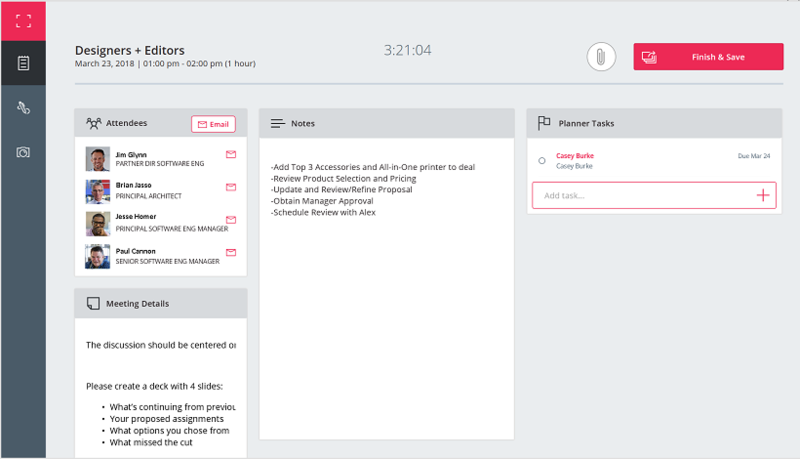 View upcoming meeting details, take notes, assign tasks in Planner, and add sketches and images all within a single app. Ensure pertinant notes and action items are tracked by exporting to OneNote and sending via Outlook with a single click! QuickTask is targeted at managing your inbox, while quickly creating follow-up tasks for important items. You're able to monitor a distribution list and assign tasks, which is perfect for a support queue or customer inbox. Setup is required to configure the distribution lists you'd like to monitor. This can be configured in the Settings page of the app, where you can setup multiple DLs and switch between them when playing the app. Company Pulse provides an example of how to display news from various sources, weather data, and trending documents in your organization. Setup is required to configure the desired Twitter account, SharePoint list, and distribution list. Instructions are found in the Settings page when editing the app. We hope you enjoy these apps. Please leave us any feedback you have and be sure to check back as we release additional documentation and videos for the PowerApps Office Template Series. PowerApps — это служба для создания и использования пользовательских бизнес-приложений. Она подключается к вашим данным и может работать как в Интернете, так и при помощи мобильной связи. С этой службой вы сэкономите время и деньги, которые обычно тратите на разработку специального ПО. Чтобы начать работу, войдите в свою рабочую или учебную учетную запись. Регистрируясь, вы соглашаетесь с условиями предоставления услуг.